After watching the awesome clip of a Lancaster flying over London, many readers have sent links to other footage worth a look. For instance, the extremely interesting video in this post gives a previously unseen view at the Consolidated B-24J Liberator. The B-24 was among the U.S. most famous heavy bombers of WWII: at +18,400 units, it ended the conflict as the most produced heavy bomber in history and was the only to deploy U.S.’ first forerunner to precision-guided munitions during the war, the 1,000 lb. Azon guided bomb. Thanks to a GoPro camera was installed at the end of the 50 cal gun facing the retractable ball turret; the footage shot from that camera lets you see the aircraft taxiing, rotating and maneuvering in the background. 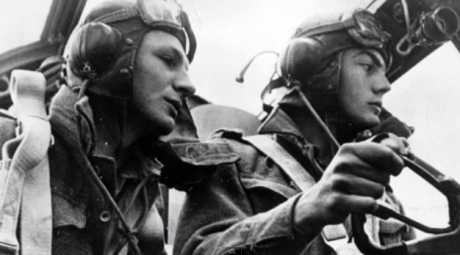 Unlike what one might think, statistics show that the ball turret gunner had the lowest combat loss rate in WWII: even if some gunners crashed with their aircraft there were some who survived using chest pack chutes, and bailing out of the aft door or open bomb bay. If the turret gunner was small enough he could have worn a B-8 backpack parachute in the turret and could potentially bail out directly from the turret. I found it extremely cool, don’t you?